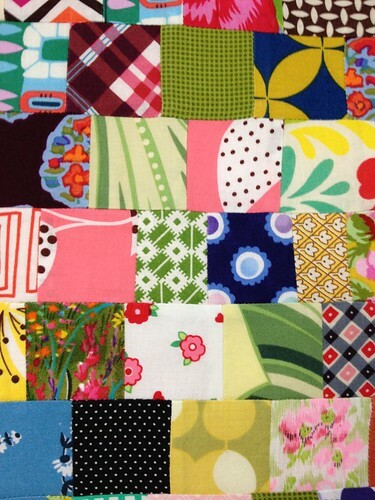 Remember all those vintage, hand cut two inch squares I mentioned at the bottom of this post? I've been trying to think of a way to use them. I tried sewing them up with some of my scraps and a pretty Delft blue Kona, but it wasn't enjoyable. The two inch size of the hand cut squares is not consistent and it made matching the seams a real pain. There was a lot of stretching and pinning involved and in the end, they are still distorted. 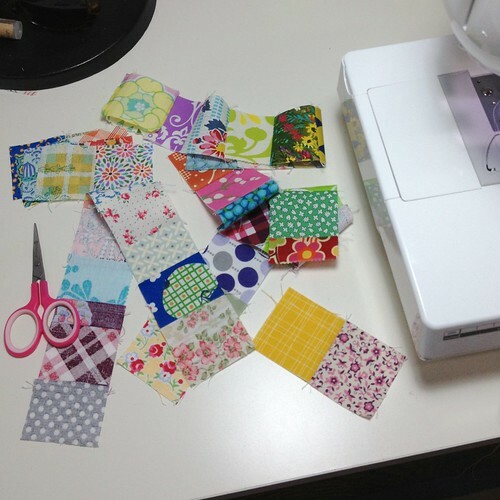 I was playing with the hand cut scraps this morning with some of the scraps from my overflowing scrap bins and thought that if I trimmed a few of them down (to 1.5" x 2" or so) and then sew them together, it would create more of a brick pattern and I wouldn't have to match the seams. 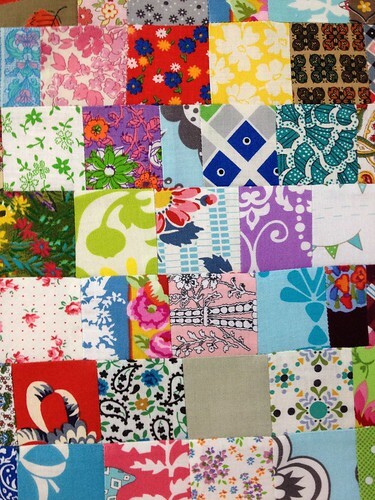 Let's see, stretching and pinning hundreds and hundreds of two inch squares or willy-nilly sewing them together with abandon? Willy-nilly it is! I figured that with seams that wonky, I needed to give my quilt a name to help explain the mess. I Googled the names that initially came to mind, but they were all taken... hot mess, vomit, etc. I could just call it the Visually Disturbing quilt because that's exactly what it will be, visually disturbing. But then it's nickname would be "the VD quilt" and nobody wants to cuddle up under that. 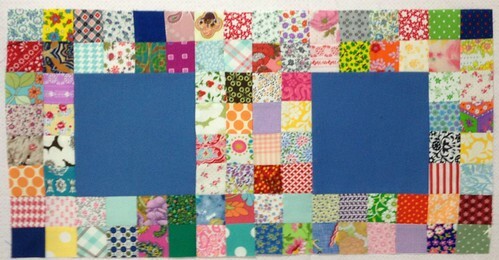 Maybe something like the Intentionally Crooked Visually Disturbing quilt? No, that acronym is ICVD. Again, gross. Replace "crooked" with "mismatched"? IMVD? Um, nope. Flip it around? Yea, that's it! 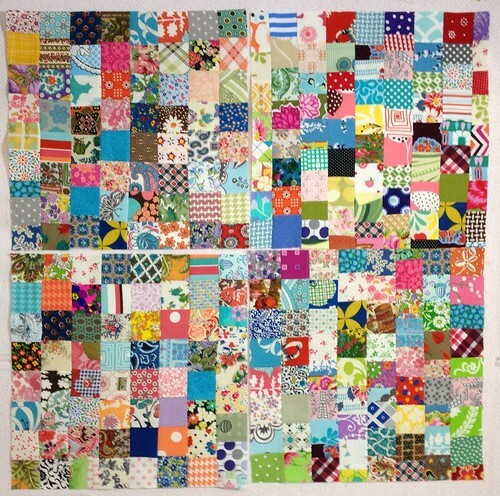 The Visually Disturbing And Intentionally Mismatched scrap quilt. I'll call it the "VDAIM" for short. So, I present you with the first four blocks of my VDAIM scrap quilt. I'm going to square them into 12.5" blocks and wait until I have more blocks before sewing them together. 1. Departing from a recognized, conventional, or established norm or pattern. 1. An individual who deviates markedly from an established norm, especially a person of odd or unconventional behavior. 2. Physics. An oblong solid mass that has properties somewhat defiant of gravity; Similar to a gyroscope. Mary: "Have you seen Frank?" Jessi: "Nah that kid's vdaim"
Departing from the conventional norm or pattern? Yes, I think this name fits. And, there truly is nothing new under the sun. Ha! I love it! Scrap vomit works for me!